The presidential palace was enveloped in smog on Nov. 3. New Delhi’s antipollution efforts have failed to keep up with growth. 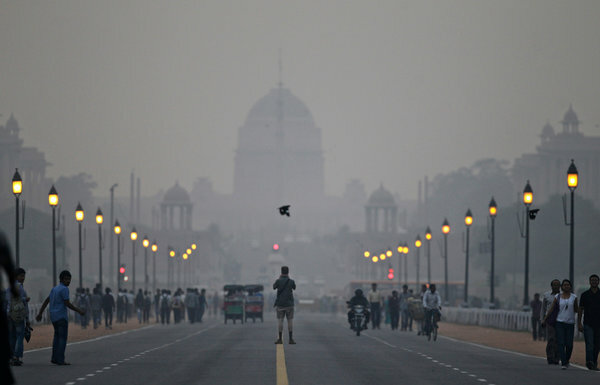 NEW DELHI — When an acrid blanket of gray smog settled over India’s capital last month, environmentalists warned of health hazards, India’s Supreme Court promised action and state officials struggled to understand why the air had suddenly gone so bad. The heavy smog has dissipated for the moment, but it has left behind a troubling reality for one of India’s most important cities: Despite measures to improve air quality, pollution is steadily worsening here, without any simple solutions in sight. Delhi, a growing metropolis of nearly 20 million people, has struggled to reconcile its rapid economic growth with environmental safeguards. Over a decade ago, the city introduced a host of policies that raised emission standards, closed polluting industries and expanded green spaces. It made a costly investment to convert the city’s buses and auto rickshaws to compressed natural gas. For a time, air quality visibly improved. Ms. Roychowdhury and other environmentalists say the government must now concentrate on slowing the rising number of vehicles on New Delhi’s roads. Each day, about 1,400 new vehicles hit the roads of the city, already home to over seven million registered vehicles, a 65 percent jump from 2003. As a result, fine-particle pollution has risen by 47 percent in the last decade. Nitrogen dioxide levels have increased by 57 percent. Environmentalists recommend a hefty tax on diesel vehicles, a steep increase in parking charges and a rapid upgrade of the public transportation system to ensure more timely bus service and a better integration of buses and the metro rail system. But government officials say that a mere crackdown on vehicles ignores other aspects of the problem. They note that New Delhi is landlocked and lacks the coastal breezes that flush polluted air out of other major Indian cities like Mumbai, Kolkata and Chennai. Ms. Dikshit said New Delhi’s rapidly growing population and prosperity add to the pollution. Officials say much of the pollution comes from neighboring areas, where emissions standards are lower and environmental policies virtually nonexistent. For days after November’s smog spell, many Delhi officials responded by blaming a coincidence of factors, including agricultural burnings in the neighboring states of Punjab and Haryana and the impact of a cyclone off the southern coast. Weather conditions played a role, environmentalists agree, but that is no excuse for ignoring the underlying problems. Until two years ago, environmentalists and city officials in New Delhi lacked monitoring equipment to determine air pollution levels, and scientists and policy makers were dependent on ad hoc surveys conducted manually or on data from the national pollution body that often were incomplete or arrived too late. In 2010, the Delhi government posted six state-of-the-art monitoring machines around the capital that now constantly measure a host of pollutants, sending real-time data to a publicly accessible Web site. In November, the machines recorded pollution levels at least six or seven times greater than the national standard for safe air. On Nov. 9, for instance, the levels of particulate matter called PM10 near the University of Delhi measured 908 micrograms per cubic meter, against the standard limit of 100, falling into the “very unhealthy” category. The city’s doctors are worried. Dr. Randeep Guleria, who runs the pulmonary medicine department at the All India Institute of Medical Sciences, said the number of emergency visits relating to respiratory and heart problems had risen sharply this winter. What is going on in New Delhi reflects a larger trend. A recent study published in the medical journal Lancet shows air pollution has become a major health risk in developing countries, contributing to about 3.2 million premature deaths worldwide. South Asian countries are particularly vulnerable, the study found. The local government has commissioned a study to understand what exactly caused the smog, and is working on an “air action plan” that would expand the subway system, introduce a network of bike lanes and make the city’s roadways more friendly to pedestrians. The Supreme Court, which has played the role of environmental watchdog in Delhi for more than a decade, has recommended a more politically delicate measure: imposing an “environment compensation charge” of 25 percent on new diesel vehicles and requiring a much smaller fee for existing gasoline- and diesel-powered cars. Ms. Dikshit, Delhi’s chief minister, has agreed to consider such a “green tax” and welcomed other solutions, even as she denied that the city’s pollution was reaching alarming levels. A version of this article appeared in print on December 27, 2012, on page A10 of the New York edition with the headline: ‘Untamed Motorization’ Wraps an Indian City in Smog.